The First Provincial Bank of Taiwan in Taipei, Republic of China was formerly the central bank of the Republic of China and issued the New Taiwan dollar. A bank [bæŋk] is a business that provides banking services for profit. Traditional banking services include receiving deposits of money, lending money, and processing transactions. Some banks (called Banks of Issue) issue banknotes as legal tender. Many banks offer ancillary financial services to make additional profit; for example: selling insurance products, investment products, or stock broking. Traditionally, a bank generates profits from transaction fees on financial services and from the interest it charges for lending. In recent history, with historically low interest rates limiting banks' ability to earn money by lending deposited funds, much of a bank's income is provided by overdraft fees and riskier investments. In most jurisdictions the business of banking is regulated and banks require permission to trade. Authorization to trade is granted by bank regulatory authorities and provide rights to conduct the most fundamental banking services such as accepting deposits and making loans. There are also financial institutions that provide banking services without meeting the legal definition of a bank. Banks have a long history, and have influenced economies and politics for centuries. The development of central banks, responsible for the monetary policy of their country and with supervisory powers over banks, ensures that financial institutions do not behave recklessly or fraudulently. In most countries, the central bank is state-owned and has a minimal degree of autonomy to allow for the possibility of government intervention in monetary policy. 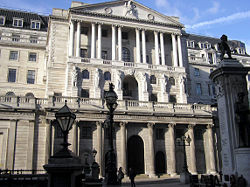 While commercial banks serve individuals and businesses, facilitating the flow of money and thus supporting economic transactions, the central bank's function is to maintain economic stability by storing and regulating the flow of money, much as various organs in the human body regulate the production and flow of blood, including the production and flow of red and white blood cells, to support the health of the body as a whole. Historically, the body of human society has suffered ill-health, as has its economic system, including the collapse of several banking systems. As humankind develops greater maturity and a peaceful world of harmony and co-prosperity is established, the economic system, including the banking system, will enjoy greater health. 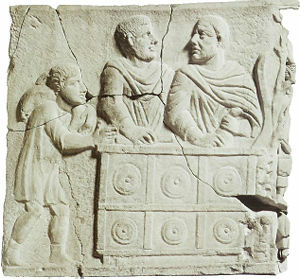 Roman sculpture showing moneychanger from fourth century B.C.E. The history of banking is closely related to the history of money. 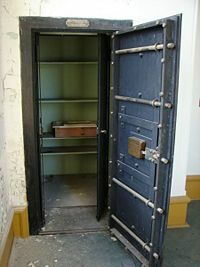 As monetary payments became important, people looked for ways to safely store their money. As trade grew, merchants looked for ways of borrowing money to fund expeditions. The first banks were probably the religious temples of the ancient world. In them was stored gold in the form of easy-to-carry compressed plates. Their owners justly felt that temples were the safest places to store their gold as they were constantly attended and well built and were sacred, thus deterring would-be thieves. There are extant records of loans from the eighteenth century B.C.E. in Babylon that were made by temple priests to merchants. Ancient Greece holds further evidence of banking. Greek temples, as well as private and civic entities, conducted financial transactions such as loans, deposits, currency exchange, and validation of coinage. There is evidence too of credit, whereby in return for a payment from a client, a moneylender in one Greek port would write a credit note for the client who could "cash" the note in another city, saving the client the danger of carting coinage with him on his journey. Ancient Rome perfected the administrative aspect of banking and saw greater regulation of financial institutions and financial practices. Charging interest on loans and paying interest on deposits became more highly developed and competitive. Most early religious systems in the ancient Middle East, and the secular codes arising from them, did not forbid usury. These societies regarded inanimate matter as alive, like plants, animals, and people, and capable of reproducing itself. Hence if you lent 'food money', or monetary tokens of any kind, it was legitimate to charge interest. Food money in the shape of olives, dates, seeds, or animals was lent out as early as c. 5000 B.C.E., if not earlier. Among the Mesopotamians, Hittites, Phoenicians, and Egyptians, interest was legal and often fixed by the state. However, the Jews took a different view of the matter. The Torah and later sections of the Hebrew Bible criticize interest-taking, but interpretations of the Biblical prohibition vary. One common understanding is that Jews are forbidden to charge interest upon loans made to other Jews, but allowed to charge interest on transactions with non-Jews, or Gentiles. However, the Hebrew Bible itself gives numerous examples where this provision was evaded. Johnson holds that the Hebrew Bible treats the lending as philanthropy in a poor community whose aim was collective survival, but which is not obliged to be charitable towards outsiders. The ascent of Christianity in Rome and its influence restricted banking, as the charging of interest was seen as immoral. Jews were ostracized from most professions by local rulers, the Church and the guilds, were pushed into marginal occupations considered socially inferior, such as tax and rent collecting and moneylending, while the provision of financial services was increasingly demanded by the expansion of European trade and commerce. Medieval trade fairs, such as the one in Hamburg, contributed to the growth of banking in a curious way: moneychangers issued documents redeemable at other fairs, in exchange for hard currency. These documents could be cashed at another fair in a different country or at a future fair in the same location. If redeemable at a future date, they would often be discounted by an amount comparable to a rate of interest. Eventually, these documents evolved into bills of exchange, which could be redeemed at any office of the issuing banker. These bills made it possible to transfer large sums of money without the complications of hauling large chests of gold and hiring armed guards to protect the gold from thieves. The Templars' wide flung, large land holdings across Europe emerged in the 1100-1300 time frame as the beginning of Europe-wide banking, as their practice was to take in local currency, for which a demand note would be given that would be good at any of their castles across Europe, allowing movement of money without the usual risk of robbery while traveling. Ironically, the papal bankers were the most successful of the Western world. When Pope John XXII (born Jacques d'Euse (1249 - 1334) was crowned in Lyon in 1316, he set up residency in Avignon. The accompanying growth of Italian banking in France was the start of the Lombard moneychangers in Europe, who moved from city to city along the busy pilgrim routes important for trade. Key cities in this period were Cahors, the birthplace of Pope John XXII, and Figeac. Perhaps it was because of these origins that the term Lombard is synonymous with Cahorsin in medieval Europe, and means 'pawnbroker'. The Rothschild family organized similar banks across Europe, particularly in Germany and Britain. The Rothschild bank dealt in bills of exchange and made various kinds of loans. Modern Western economic and financial history is usually traced back to the coffee houses of London. Coffeehouse proprietors overheard many conversations about business and even made modest investments themselves. They came up with the idea of producing lists of share prices or shipping data. The weekly published lists of the London coffee houses (simply pasted to the door) made it possible for the first time to compare the relative success (and liquidity) of bankers and investment opportunities. This was much more efficient than word of mouth. These lists were most notably Jonathan's Coffee-House and Edward Lloyd's. In 1698 John Castaing, began publishing a twice weekly newsletter of share and commodity prices, which he sold at Jonathan's, and which led to the London Stock Exchange. Lloyd's list led to the establishment of the famous insurance exchange Lloyds of London and the Lloyd's Register of Shipping. The London Royal Exchange was established in 1565. At that time moneychangers were already called bankers, though the term "bank" usually referred to their offices, and did not carry the meaning it does today. There was also a hierarchical order among professionals; at the top were the bankers who did business with heads of state, next were the city exchanges, and at the bottom were the pawn shops or "Lombard"'s. Most European cities today have a Lombard street where the pawn shop was located. After the siege of Antwerp trade moved to Amsterdam. In 1609 the Amsterdamsche Wisselbank (Amsterdam Exchange Bank) was founded which made Amsterdam the financial centre of the world until the Industrial Revolution. Banking offices were usually located near centers of trade, and in the late seventeenth century, the largest centers for commerce were the ports of Amsterdam, London, and Hamburg. Individuals could participate in the lucrative East India trade by purchasing bills of credit from these banks, but the price they received for commodities was dependent on the ships returning (which often did not happen on time) and on the cargo they carried (which often was not according to plan). The commodities market was very volatile for this reason, and also because of the many wars that led to cargo seizures and loss of ships. Around the time of Adam Smith (1776) there was a massive growth in the banking industry. Within the new system of ownership and investment, moneyholders were able to reduce the State's intervention in economic affairs, remove barriers to competition, and, in general, allow anyone willing to work hard enough—and who also has access to capital—to become a capitalist. It was not until over 100 years after Adam Smith, however, that US companies began to apply his policies in large scale and shift the financial power from England to America. A small vault from 1901. By the early 1900s New York City was beginning to emerge as a world financial center. Companies and individuals acquired large investments in (other) companies in the US and Europe, resulting in the first true market integration. This comparatively high level of market integration proved especially beneficial when World War I came—both sides in the conflict sought funds from the United States, by issuing new securities and selling existing holdings, though the Allied Powers raised by far the larger amounts. Being a lender to the world resulted in the largest growth of a financial economy to that point. The stock market crash of 1929 was a global event—markets crashed everywhere, all at the same time, and the volume of foreign selling orders was high. The Great Depression followed, and the banks were blamed for it, although the evidence has never been strong to connect the speculative activities of the banks during the 1920s with either the crash or the subsequent depression of the 1930s. Nonetheless, there were three prominent results from these events that had great effect on American banking. The first was the passage of the Banking Act of 1933 that provided for the Federal Deposit Insurance system and the Glass–Steagall provisions that completely separated commercial banking and securities activities. Second was the depression itself, which led in the end to World War II and a 30-year period in which banking was confined to basic, slow-growing deposit taking and loan making within a limited local market only. And third was the rising importance of the government in deciding financial matters, especially during the post-war recovery period. As a consequence, there was comparatively little for banks or securities firms to do from the early 1930s until the early 1960s. In the 1970s, a number of smaller crashes tied to the policies put in place following the depression, resulted in deregulation and privatization of government-owned enterprises in the 1980s, indicating that governments of industrial countries around the world found private-sector solutions to problems of economic growth and development preferable to state-operated, semi-socialist programs. This spurred a trend that was already prevalent in the business sector, large companies becoming global and dealing with customers, suppliers, manufacturing, and information centers all over the world. Global banking and capital market services proliferated during the 1980s and 1990s as a result of a great increase in demand from companies, governments, and financial institutions, but also because financial market conditions were buoyant and, on the whole, bullish. Interest rates in the United States declined from about 15 percent for two-year U.S. Treasury notes to about 5 percent during the 20-year period, and financial assets grew then at a rate approximately twice the rate of the world economy. Such growth rate would have been lower were it not for the profound effects of the internationalization of financial markets especially U.S. Foreign investments, particularly from Japan, who not only provided the funds to corporations in the U.S., but also helped finance the federal government; thus, transforming the U.S. stock market by far into the largest in the world. Nevertheless, the dominance of U.S. financial markets has been disappearing and there has been an increasing interest in foreign stocks. The extraordinary growth of foreign financial markets results from both large increases in the pool of savings in foreign countries, such as Japan, and, especially, the deregulation of foreign financial markets, which has enabled them to expand their activities. Thus, American corporations and banks have started seeking investment opportunities abroad, prompting the development in the U.S. of mutual funds specializing in trading in foreign stock markets. Such growing internationalization and opportunity in financial services has entirely changed the competitive landscape, as now many banks have demonstrated a preference for the “universal banking” model so prevalent in Europe. Universal banks are free to engage in all forms of financial services, make investments in client companies, and function as much as possible as a “one-stop” supplier of both retail and wholesale financial services. This growth and opportunity also led to an unexpected outcome: entrance into the market of other financial intermediaries, or "nonbanks." Large corporate players were beginning to find their way into the financial service community, offering competition to established banks. The main services offered included insurances, pension, mutual, money market and hedge funds, loans and credits and securities. Hence, the distinction between different financial institutions is diminishing. Banks' activities can be characterized as retail banking, dealing directly with individuals and small businesses, and investment banking, relating to activities on the financial markets. Most banks are profit-making, private enterprises. However, some are owned by government, or are non-profit making. Central banks are non-commercial bodies or government agencies often charged with controlling interest rates and money supply across the whole economy. They act as Lender of last resort in event of a crisis. Commercial bank: the term used for a normal bank to distinguish it from an investment bank. After the great depression, the U.S. Congress required that banks only engage in banking activities, whereas investment banks were limited to capital markets activities. Since the two no longer have to be under separate ownership, some use the term "commercial bank" to refer to a bank or a division of a bank that mostly deals with deposits and loans from corporations or large businesses. Community Banks: locally operated financial institutions that empower employees to make local decisions to serve their customers. Offshore banks: banks located in jurisdictions with both low taxation and low regulation. Many offshore banks are essentially private banks. Savings bank: in Europe, savings banks take their roots in the nineteenth or sometimes even eighteenth century. Their original objective was to provide easily accessible savings products to all strata of the population. 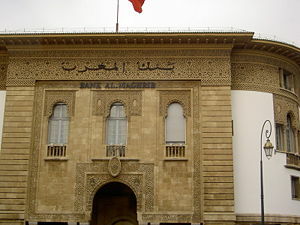 In some countries, savings banks were created on public initiative, while in others socially committed individuals created foundations to put in place the necessary infrastructure. Nowadays, European savings banks have kept their focus on retail banking: payments, savings products, credits and insurances for individuals or small and medium-sized enterprises. Apart from this retail focus, they also differ from commercial banks by their broadly decentralized distribution network, providing local and regional outreach and by their socially responsible approach to business and society. Savings and loan association (S&L): specializes in accepting savings deposits and making mortgage loans. They are often mutually held (often called mutual savings banks), meaning that the depositors and borrowers are members with voting rights and have the ability to direct the financial and managerial goals of the organization. Originally established as cooperative associations that allowed their members to obtain loans for the purpose of buying a home, they were intended to dissolve after all the members had made their purchase. The term is mainly used in the United States; similar institutions in the United Kingdom and some Commonwealth countries are called building societies. Building societies and Landesbanks: financial institutions similar to savings and loan associations. Owned by members, they offer banking and other financial services, especially mortgage lending. The term "building society" first arose in the nineteenth century, in the United Kingdom, from working men's co-operative savings groups: by pooling savings, members could buy or build their own homes. In the UK, building societies actively compete with banks for most "banking services" especially mortgage lending and deposit accounts. Ethical banks: banks that prioritize the transparency of all operations and make only social-responsible investments. Merchant banks were traditionally banks which engaged in trade financing. The modern definition, however, refers to banks which provide capital to firms in the form of shares rather than loans. Unlike Venture capital firms, they tend not to invest in new companies. Universal banks, more commonly known as a financial services company, engage in several of these activities. For example, First Bank (a very large bank) is involved in commercial and retail lending, and its subsidiaries in tax-havens offer offshore banking services to customers in other countries. Other large financial institutions are similarly diversified and engage in multiple activities. In Europe and Asia, big banks are very diversified groups that, among other services, also distribute insurance, hence the term bancassurance. Islamic banks adhere to the concepts of Islamic law. Islamic banking revolves around several well-established concepts which are based on Islamic canons. Since the concept of interest is forbidden in Islam, all banking activities must avoid interest. Instead of interest, the bank earns profit (mark-up) and fees on financing facilities that it extends to the customers. Also, deposit makers earn a share of the bank’s profit as opposed to a predetermined interest. However, it would not be prudent for a bank to lend out all of its balance sheet. It must keep a certain proportion of its funds in reserve so that it can repay depositors who withdraw their deposits. Bank reserves are typically kept in the form of a deposit with a central bank. This behavior is called fractional-reserve banking and it is a central issue of monetary policy. Some governments (or their central banks) restrict the proportion of a bank's balance sheet that can be lent out, and use this as a tool for controlling the money supply. Even where the reserve ratio is not controlled by the government, a minimum figure will still be set by regulatory authorities as part of bank regulation. Banks are susceptible to many forms of risk which have triggered occasional systemic crises. Risks include liquidity risk (the risk that many depositors will request withdrawals beyond available funds), credit risk (the risk that those that owe money to the bank will not repay), and interest rate risk (the risk that the bank will become unprofitable if rising interest rates force it to pay relatively more on its deposits than it receives on its loans), among others. The combination of the instability of banks as well as their important facilitating role in the economy led to banking being thoroughly regulated. The amount of capital a bank is required to hold is a function of the amount and quality of its assets. Major banks are subject to the Basel Capital Accord promulgated by the Bank for International Settlements. In addition, banks are usually required to purchase deposit insurance to make sure smaller investors are not wiped out in the event of a bank failure. Another reason banks are thoroughly regulated is that ultimately, no government can allow the banking system to fail. There is almost always a lender of last resort—in the event of a liquidity crisis (where short term obligations exceed short term assets) some element of government will step in to lend banks enough money to avoid bankruptcy. Large banks in the United States are some of the most profitable corporations, especially relative to the small market shares they have. This amount is even higher if one counts the credit divisions of companies like Ford, which are responsible for a large proportion of those companies' profits. In the United States banks have taken many measures to ensure that they remain profitable while responding to ever-changing market conditions. First, this includes the Gramm-Leach-Bliley Act, which allows banks again to merge with investment and insurance houses. Merging banking, investment, and insurance functions allows traditional banks to respond to increasing consumer demands for "one-stop shopping" by enabling cross-selling of products (which, the banks hope, will also increase profitability). Second, they have moved toward risk-based pricing on loans, which means charging higher interest rates for those people who they deem more risky to default on loans. This dramatically helps to offset the losses from bad loans, lowers the price of loans to those who have better credit histories, and extends credit products to high risk customers who would have been denied credit under the previous system. Third, they have sought to increase the methods of payment processing available to the general public and business clients. These products include debit cards, pre-paid cards, smart-cards, and credit cards. These products make it easier for consumers to conveniently make transactions and smooth their consumption over time (in some countries with under-developed financial systems, it is still common to deal strictly in cash, including carrying suitcases filled with cash to purchase a home). However, with convenience there is also increased risk that consumers will mis-manage their financial resources and accumulate excessive debt. Banks make money from card products through interest payments and fees charged to consumers and companies that accept the cards. The banks' main obstacles to increasing profits are existing regulatory burdens, new government regulation, and increasing competition from non-traditional financial institutions. In United States history, the National Bank was a major political issue during the presidency of Andrew Jackson (1829–1837). Jackson fought against the bank as a symbol of greed and profit-mongering, antithetical to the democratic ideals of the United States. Many people consider that various banking policies take advantage of customers. 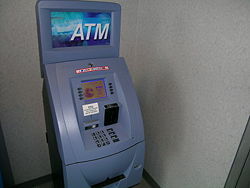 Specific concerns are policies that permit banks to hold deposited funds for several days, to apply withdrawals before deposits or from greatest to least, which is most likely to cause the greatest overdraft, that allow backdating funds transfers and fee assessments, and that authorize electronic funds transfers despite an overdraft. In the U.S., credit unions have also gained popularity as an alternative financial resource for many consumers. Also, in various European countries, cooperative banks are regularly gaining market share in retail banking. Tiwari, Rajnish and Stephan Buse. 2006. The German Banking Sector: Competition, Consolidation and Contentment, Hamburg University of Technology (TU Hamburg-Harburg) Retrieved October 21, 2007. Brunner, A., J. D. Decressin., Hardy, and B. Kudela. 2004. Germany’s Three-Pillar Banking System – Cross-Country Perspectives in Europe. Occasional Paper, International Monetary Fund, Washington, DC: 2004. Rothbard, Murray N. 1983. The Mystery of Banking. Retrieved October 21, 2007. This page was last modified on 12 April 2008, at 12:25.